Johnson's Baby Soap - 175 gm | Multicolour | Helps to keep baby skin smooth and soft. Keep your baby fresh and clean by using this baby soap. 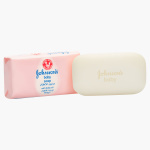 This soap keeps your little one's skin soft and smooth and prevents dryness. Enriched with moisturising properties, this soap is a must-have. Feature 2 : Protect your baby skin from dryness and keep moisturized. Feature 1 : Helps to keep baby skin smooth and soft.